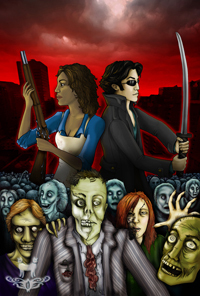 Cannibal Contagion is a game of mental stress and violent survival against hordes of supernatural cannibals. The players use high-stakes playing-card battles to determine the outcomes of their actions, with a heavy focus on pure primal narrative and totally badass action. These pages contain a complete role-playing game, with rules detailing character creation, mechanics for resolution of mass-character conflicts, methods for generating your own custom Contagion effects, guides and advice on how to set up and run games, examples of rules in play, and a slew of quick-draw tables to help you jump right in and play without a moment’s notice. Read these rules, grab your friends and a deck of playing cards, and get ready for some zombie-murdering comedic survival horror adventures.